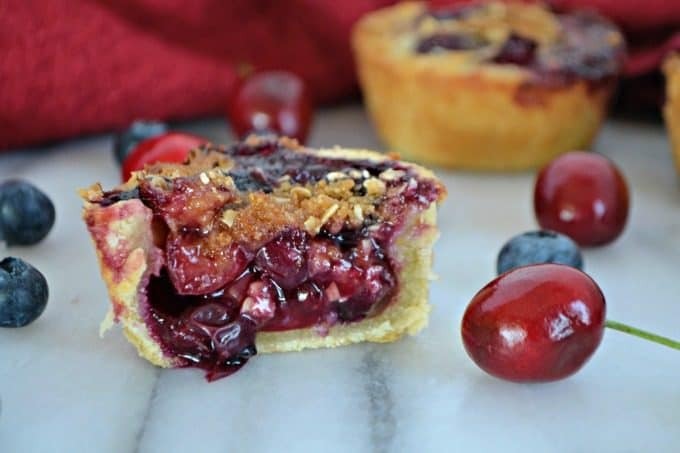 Blueberry Cherry Mini Crumb Pies – fresh blueberries and cherries give you the fresh tastes of summer in a bite-sized treat! *This was originally posted August 25, 2012, but has been updated in format and with pictures. A few original pictures remain below as does the content. Some people talk too much. Some people don’t talk enough. I think I’m just trying to fill space because I actually have nothing to talk about. I can put ingredients together and come up with something that might be tasty, but make it in 20 minutes. Oh yeah, there’s no way. I know myself and when things get too stressful, I have a tendency to freeze. And I’d freeze especially if Alex Guarnaschelli were a judge that day. I do think it’d be cool to see my fellow bloggers battling it out with surprise ingredients from a picnic basket though. They have my total support. 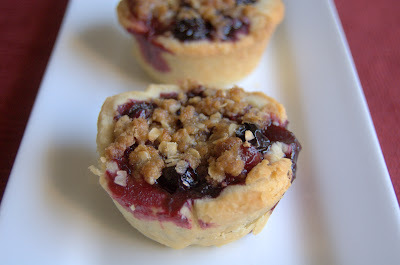 Just like these Blueberry Cherry Mini Crumb Pies. 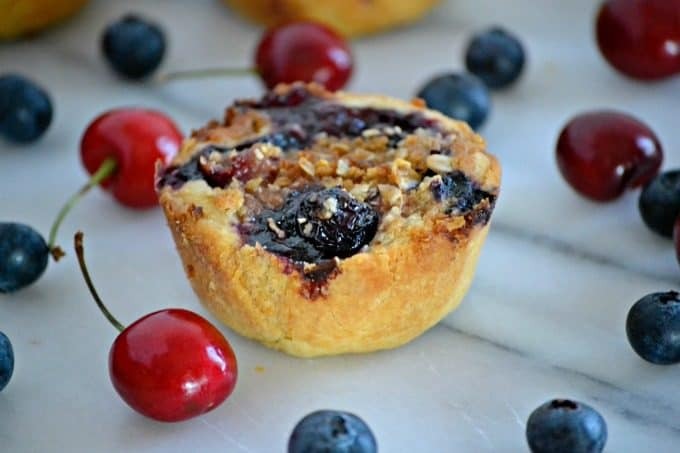 These Blueberry Cherry Mini Crumb Pies contain the fresh tastes of summer in a bite-sized treat! Prepare a standard 12-cup muffin tin by greasing it with butter or cooking spray. In a large mixing bowl, whisk together flour, sugar and salt. With a pastry knife, cut butter into flour mixture. Combine until it resembles coarse meal. In a small bowl, whisk together ice water and egg yolk. Add water mixture to dough and mix with a wooden spoon until it comes together in a ball. Divide dough in half and form into separate balls. Refrigerate dough for at least 20 minutes. In a medium bowl, combine sugar, cornstarch, and lemon zest. Add the blueberries, cherries and lemon zest and toss gently to completely coat. Set aside. In a small bowl, combine brown sugar, oats, cinnamon, flour and salt. Using a fork, cut in butter until it resembles coarse meal; set aside. Remove one package of dough from the refrigerator. On a lightly floured surface, roll the dough to about 1/4-inch thick. Using a 4-inch round cookie or biscuit cutter, cut circles in the dough. 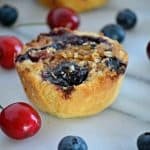 Place into a prepared muffin cup, gently molding it to the bottom and sides of the tin. Gather the scraps of dough, re-roll and re-cut. Place about 1 1/2 - 2 tablespoons of fruit filling into each dough cup. 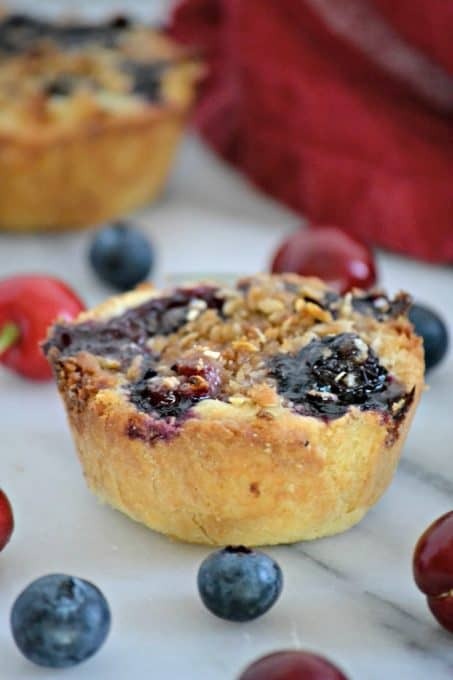 Sprinkle the crumb topping evenly over each of the filled muffin cups. Bake for 18-20 minutes, when edges are a golden brown. A tip, and you can take it or leave it, but I highly suggest that you place a baking sheet lined with tin foil on the baking rack below the muffin tin inside the oven. 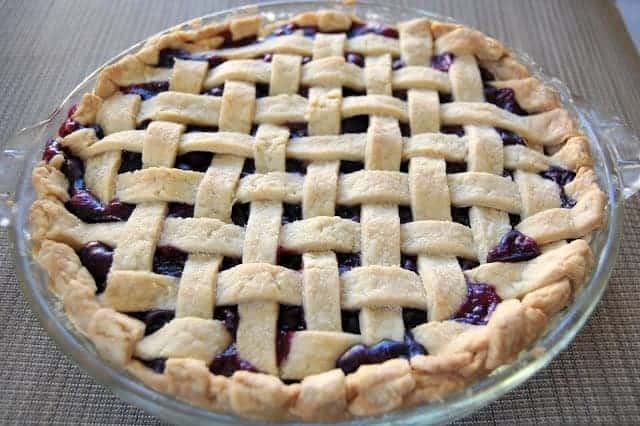 This will prevent any juices that may runneth over the sides of your pies to collect on the bottom of the oven. Which would consequently set off an alarm which in turn sends the dog into a tizzy, shaking like it’s the end of the world. Not like that happened or anything. 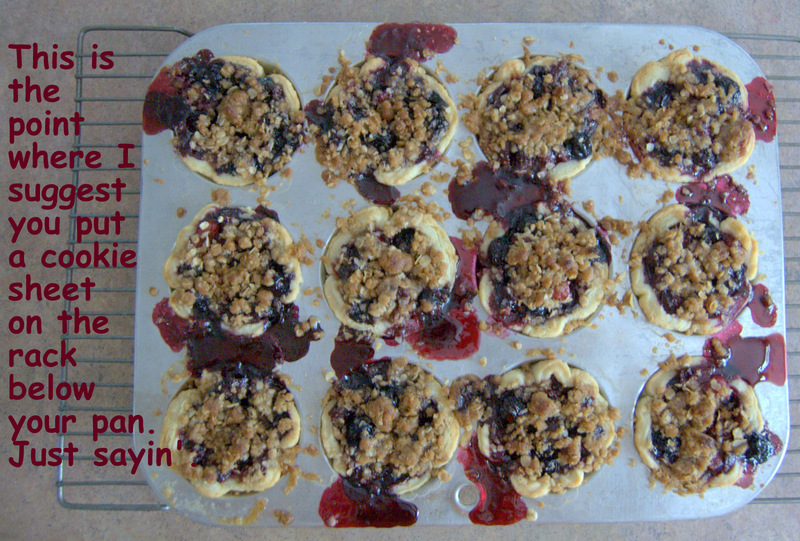 I rate everything I bake on a scale of 1-4 with 4 being the best and these Blueberry Cherry Mini Crumb Pies earned 3 1/2 rolling pins. I could have eaten at least 4 in just one sitting, BUT…I was a good girl. They really were the perfect size because they weren’t too big or too small. They were just right. 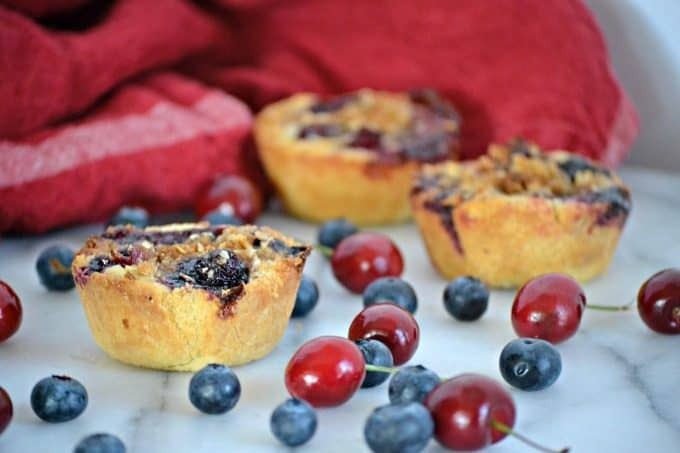 We loved the blueberry and cherry combination with a hint of lemon and the crumb topping was the perfect finishing touch. Oh, and the vanilla ice cream we ate it with was pretty good, too. You need to eat it with some ice cream. It’s DA BOMB!Here are a couple of the original pictures. Thanks for the warning about the cookie sheet. Who would want all those alarms going off? These look delicious and I love minis. Can you use can pie filling instead???? Sure, Kim! I don’t see why not. 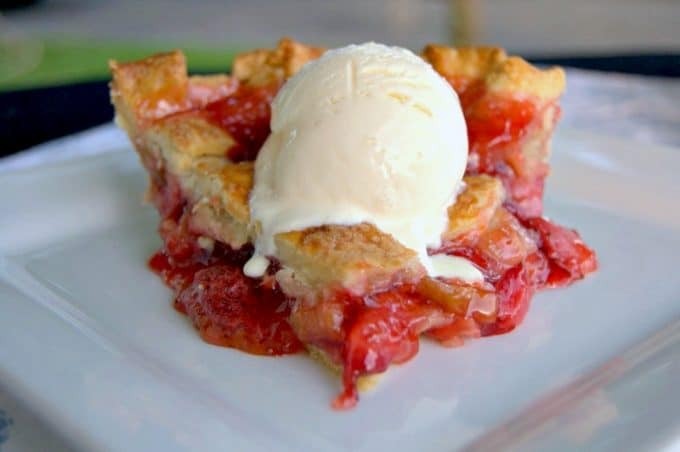 I think the pie filling would taste really good in them, too! I was thinking of using apples. Do you think I should cook them first or I guess I could use apple pie filling. I guess it is time to experiment with different fruit. Thanks for the recipe.